Here at Safa Jewelers, our Grand Seiko watch collection is a marvel to be witnessed. Based in Edison, New Jersey in Menlo Park Mall, we service customers with the most robust, precise, and stunning additions to the realm of the timekeeping industry. Crafted in the The Shizuku-Ishi Watch Studio located in Iwate Prefecture, expert craftsmen and craftswomen have continued to adorn Grand Seiko timepieces with the signature lion engraved on the back of each Seiko watch since 1960, establishing the Seiko here and forever more as the “King of Watches”. At Safa Jewelers, we present our customers with a full array of collections inspired by the Grand Seiko watch classic series. If you enjoy electronically powered timekeeping, check out our Spring Drive 9R series. Because Grand Seiko has mastered the art of incorporating both electronic and mechanical mastery of watchmaking, the Spring Drive 9R series flourishes in its ability to harness the strength of luxurious mechanically generated energy and an electronic regulator, delivering precision unlike any watch of its kind. Accented with marked numerals and a bold selection of intricate color and detail, the hour and minute hands bear the resemblance of a crossed star emanating to the heavens. 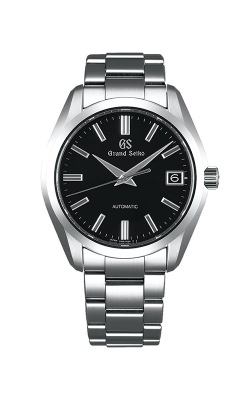 The Mechanical 9S Grand Seiko watch series is also a force to be reckoned with. With parts adjusted by hand to the nearest increments of one hundredth of a millimeter, the brand’s team of gifted artisans exhibit skill that far surpass the average watchmaker’s, which further procures our Grand Seiko watch collection as the greatest in the world. Grand Seiko’s mechanical line features a brilliant color scheme ranging from the coolest of metallic blues engulfing the bezel, to an apple red, setting ablaze the Star struck face of the timepiece. Their signature Quartz 9F series also offers a revelation to the timepiece enthusiast’s life-long commitment to servicing its owner. Armed with a premium Quartz crystal, a classic color pallet of gold white, silver, and black, and a smooth stainless steel finish, Caliber 9F secures its title as a Grand Seiko watch, unhindered by the heralding effects of gravity, and demonstrating everlasting performance and durability of unfathomable proportion. Why Shop for Grand Seiko Watches at Safa Jewelers? Here at Safa Jewelers, our staff of highly dedicated and knowledgeable personnel continue to strive and excel at offering our customers the most unique and enhanced experience. With access to exclusive brand catalogues our trained experts consider the finest details in assisting our customers with their purchase within the world of luxury timepieces and extravagant jewelry. Offering 0% financing options and a lifetime diamond upgrade, experience diamond bridal and engagement pieces to brand name timepieces including Raymond Weil, Longines, and Oris, like never before. If you’re near Edison, Monmouth County, Middlesex County, or Staten Island, come to Safa Jewelers so we can help you find and define exquisite luxury.